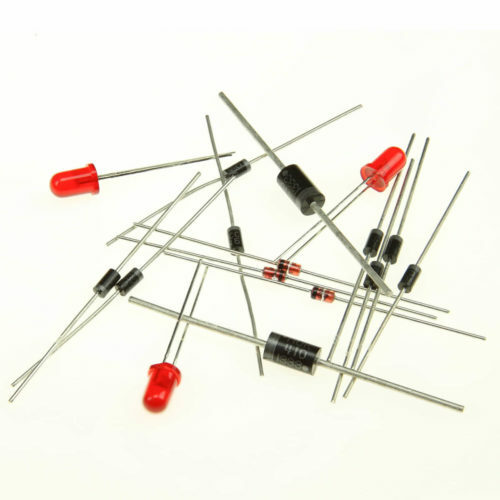 7 pack of replacement 1N4001DICT-ND rectifier diodes. MSx30 kit part number D1, D2, D3, D9, D10, D11. 2 pack of 1N5819DICT-ND Schottky diodes.MSx30 D17, D18. 3 pack of replacmenent red LEDs. Part number 67-1102-ND. These serve as D14, D15, and D16 on the V3.0 boards. On the V2.2 boards, they're D17, D18, and D19. Replace damaged LEDs or add more blinky lights to your project. Replacement diode for the D19 component in V3.0 boards. This is the first thing that blows if you accidentally short the 12 volt and 5 volt sides together. It's a 5.6 volt, 1 watt zener.